So NYPD, Boston PD and London Met Police, plus 1,000s more police depts ALL use Twitter. Come on #JCF – keep up. No cost, just results. @marxshields @MizDurie As long as they focus on crime-fighting instead of crime-solving, #JCF will NOT see [or] appreciate benefits of Twitter. As you can imagine there was a lot of resistance to the British imports into the JCF. Most of them have served their time and moved on but Shields, known as @marxshields on Twitter, is still here working privately as a security consultant. Ever one for upgrading to new technologies, in recent times he has been urging the JCF to start using DNA testing and Twitter, the detective’s tool par excellence, one i myself have been recommending to both my academic colleagues and the journalistic community in Jamaica for years. The reason? It’s the latest, most innovative means of news and information-gathering, like tapping into a vast reservoir, a virtual motherlode of data waiting to be mined; at the same time it offers conduits to reach multiple networks, to crowdsource whatever it is you need or just to transmit your message far and wide. 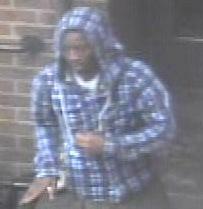 Has anyone seen this ‘Male wanted for armed robbery’? Here’s the picture we have of him. or Does anyone know where this place is? with a photo attached to it will bring in valuable responses that may very well help solve your research problem if you’re an academic or the crime if you happen to be a member of the Police Force. If you wanted to know for instance how many police forces around the world are already using Twitter you would post a tweet like this: Are the #police in YOUR country using Twitter yet? Please use #smartpolicing when replying. The hashtag ‘smartpolicing’ would collect answers from all around the world which could then be separately verified for accuracy. But as @MichaelAssured pointed out the JCF will only realize the value of Twitter if they accept that their mandate is crime-‘solving’ rather than crime-‘fighting’. With crime as rampant as it is in Jamaica and the Jamaican police specializing in crime-fighting you would think that they’d be experts at it now, neatly taking out criminals as they encounter them but no! Unfortunate citizens who happen to be in the vicinity of suspects will be taken out too; when questions are raised ‘collateral damage’ will be mentioned as in Tivoli Gardens three years ago to the day, when local security forces (army and police with benign technical assistance from the US) breached the barricaded community in search of the most wanted Don in the history of Jamaica–Christopher “Dudus” Coke. In the days that followed 73 plus civilians were killed, no Don was found and despite claims by the armed forces that they were fighting heavily armed gangs loyal to Dudus only 6 guns were recovered. But let’s not rehash history. We are using the unfortunate events of May 23rd to catapult this first Ja Blog Day and to focus collectively on the problem of policing here and the wanton slaughter of Jamaican citizens. The extra-judicial killings are too numerous to itemize here. I will pick just one to focus on because it illustrates the problem really well. It’s the case of Matthew John Lee, a generous young middle class boy, who gave two less fortunate friends a ride one day. The police descended on them as they drove through an affluent community many of us traverse daily and after the usual controversial ‘encounter’ all three were shot dead in broad daylight. I won’t repeat the details here because they were very well captured in this video footage of a show called Impact in which journalist Cliff Hughes explored the case with family members and the President of Jamaicans for Justice, Carolyn Gomes. I deliberately cite the case of Matthew Lee because he was not a ghetto youth, the perennial victims of encounters with the police. He was a young middle class youth, a former junior hockey champion, a citizen in good standing, yet the police didn’t bat an eyelid in killing him. This suggests that a new frontier has been reached and those of us who think our elite status will give us immunity from the violence that stalks the land please take note. They came for Keith Clarke in the wee hours of the morning, they came for Matthew Lee in broad daylight and they will come for you and me whenever they please. Welcome to a reality the poor in Jamaica have always known–the Police/Armed forces are not in control–they are completely OUT of control. “Wi a pay uuno fi murder wi,” as one such hapless citizen remarked. I close with an extended quote from a former policeman who has penned a tell-all book, soon to be published, which tells it like it is from the inside. I won’t disclose his name right now but do read the excerpt below. The incident described happened in the 90s. I warn you that it contains material that may not be suitable for children or the squeamish. It’s a measure of the problem we now face. Most cops see the ghetto man as wicked, murderous, and criminal. And so he greets him with that mindset. He doesn’t see conditions; he sees an obstruction to peace and quiet. He sees the ghetto man as an animal that should be slaughtered as soon as possible. I was one of those cops. I was especially resentful of ghetto dwellers when I had had a few drinks. I abused them, kicked them, punched them and made them crawl in the gutters. I was indoctrinated not just by other police officers but by society at large. I did not like these youths who dressed outrageously and smoked weed and bleached and twisted their hair and wore earrings and nose rings. I was programmed to see them as nonentities, but the intelligence and wit of the ghetto man, his will to survive, his courage to face the bullets, baton and jailhouse was enough to open my eyes. Sometimes it takes the death of another to open your eyes. I witnessed the killing of a ghetto man by one of my patrol member and it changed my perception of people from ghettos forever. That martyr’s death was the beginning of the end for me as a police officer. It wasn’t going to be the last of such incidents I would see but it remains the most senseless act of wanton cruelty I have ever experienced. The incident keeps replaying in my mind year after year and up to this day I feel motivated to speak out against it, to bring closure to this tragedy, to have that murderer in uniform face the Courts, to have the family of that young man compensated and consoled for what I consider a calculated, pre- meditated, cold blooded murder. It was about midday when I received a call on my portable radio to assist another patrol in my vicinity. Along with my three army personnel, we covered ground quickly. On reaching we saw a young man with a broken machete in his waist trying to elude the grasp of some angry soldiers. It was in the Coronation Market area and the higglers were shouting to the cops and soldiers that the man was mentally challenged. The man seemed to be in his early twenties and was dressed in a pair of dirty short pants. The only weapon he had was the machete in his pants waist. The soldiers from the other patrol tried surrounding him, but every time one grabbed at him he would step into the running sewage by the side of the road. Suddenly I saw a soldier take aim at him with his SLR rifle and open fire. The man fell into the sewage with half his face blown away. I saw one of the soldiers in my team holding his neck. The bullet had gone on to graze him. I watched the sewage turned red. As the bloody liquid passed me I saw the front teeth of the dead youth along with gum and top lip drifting along. I watched in shock as the young man’s body quivered and he clawed the ground trying desperately to hold onto a life that had long left him. Some people were shouting, “murder” and others were just screaming. Market stalls were overturned as people ran in all directions, some running towards the scene and others running away from it. I remembered just standing there staring, immobilized by this display of wanton cruelty. I looked at the soldier who had fired and I could see the fear in his eyes. He was swinging the rifle from left to right as if he expected the crowd to storm him. I crouched and walked away, but looked again at the body of the young man in his half pants, the machete still in his waist. His killing did something to me; it tore me apart, for I was a part of this unwarranted and brutal abuse. I represented the group the soldier came from and I felt shame, anger and confusion all in one. The victim was mentally challenged, he was ill, he was helpless and he was murdered for it. I felt sick to the pit of my stomach. The soldier with the grazed neck was beside me and he was still touching the spot where the bullet had grazed him. He too was muttering his disapproval of the killing. When I returned to our base in downtown Kingston I saw the soldier who had pulled the trigger. I walked straight up to him, looked him in the eye and asked him why. He never answered. I don’t even know if he heard me. But the real shocker came when I discovered that I was perhaps the only one there who didn’t think he was a hero. Everyone else was congratulating and cheering him on. I was told later that this was not his first killing or murder, as one officer audaciously put it. By now rioting had started and we were summoned to the streets again, this time to quell the rioting. I looked at the killer once more but he didn’t look at me. He pretended to be distracted by the noise outside. He was sweating, and there was fright in his eyes. This was the first time I was looking in the eyes of a murderer, and he didn’t have twisted hair or earrings, he wasn’t dressed outrageously, or have bleached skin. He was a soldier, not the usual demonic ghetto inhabitant. It was painful to use physical force to disperse the mob that had gathered outside our command post but I had to do it. It was painful because I understood their hurt, their anger. They cursed me too, they called me ‘dutty murdering police bwoy’; some accused us of having strength only for ‘mad’ people and I will never forget the female voice that shouted above the rest “wi a pay unno fi murder wi,” That was the statement of the day, for it was true, it was shamefully true. I left the scene that evening with my team, found a bar and drank for the rest of the afternoon. Later that night there was a news report that a man of ‘unsound mind’ was killed when he attacked members of the security forces with a machete. That was the moment it dawned on me that something was very wrong with the approach and conduct of the security forces. It was the beginning of the end for me. What the police can do…Ja Blog Day! A short one to urge bloggers to unite on May 23rd to protest the brutal tactis of the Jamaican police and armed forces. 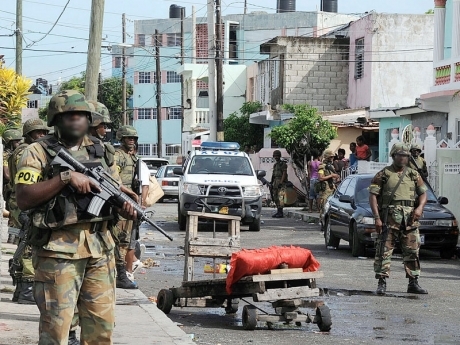 Gleaaner: Soldiers stand guard at an entrance into Tivoli Gardens during the May 2010 incursion into the volatile community – file photo. Town – File. Well, we’re counting down now to May 23rd, the third anniversary of the siege of Tivoli, a military operation in which more than 73 lives were lost, most of them civilian. The Jamaican security forces unleashed a blitzkrieg in Tivoli Gardens, a highly politicized residential community in Western Kingston, using shock and awe tactics, firing mortars, violently entering homes and massacring young male residents by all accounts. Their excuse? That most wanted Don, Christopher Lloyd Coke or the infamous ‘Dudus’, was holed up in the community with an army of gunmen protecting him. Well, they didn’t net the Don, who escaped and was captured almost a month later. Were the men slaughtered by the armed forces actually gunmen and criminals? Could they have been taken alive and arrested using more conventional methods? We’ll probably never know. To mark the tragic anniversary of the Tivoli incursion and the lives that were lost there, Jamaican bloggers are uniting to draw attention to the scourge of extra-judicial killings in Jamaica and a police force seemingly out of control and beyond restraint, legal or otherwise. We invite all bloggers to join us by publishing thoughtful, well-researched, hard-hitting commentaries on police brutality in Jamaica on May 23rd, which also happens to be Labour Day here. From Bob Marley’s famous line about waking up in a curfew, surrounded by police all “dressed in uniforms of brutality” to Lovindeer’s comical Babylon Boops (see video below), the police (often referred to as ‘Babylon’ in Jamaica) have been a popular subject for commentary and satire in Jamaica. Please add your voice to ours to make this first Ja Blog Day a meaningful and productive one! Please see further information on Ja Blog Day and how to participate immediately below the Lovindeer video. Bloggers are not given any directives about how they should post or present on the issue of police and security force abuses. The topic was chosen around the time of marches in Jamaica to remember the 1963 Good Friday Coral Gardens Incident, also known as Bad Friday. Unfortunately incidents similar to Coral Gardens persist in Jamaica, the most recent occasion being the allegations about security force abuses in 2010 during the Tivoli Gardens Incursion to find and capture Christopher Coke. Abuses by both entities happen en masse during events at Coral Gardens, Tivoli, Braeton, and Crawle but also during what should be routine interactions between the Jamaican public and the entities meant to keep the peace, the army and police force. The names that many remember are as a litany – Vanessa Kirkland, Kentucky Kid, Nicketa Cameron, Kayann Lamont, Ian Lloyd. The public often charge that the innocent are killed and that the police or army acted improperly. The army and police often claim a “shoot out,” mistake, or nothing at all. But amidst the back and forth and wondering there is too often no resolution for a community or victim’s family. Too often there is no feeling of justice if indeed there was illegality. Too often there is no search for truth, however uncomfortable or unwelcome that may be. “Many people may be resistant to speaking up and out about this issue because they’re afraid but the plain fact is that in Jamaica there are far too many and frequent questionable incidents involving the security forces and civilians,”. It is not intended that the posts produced on this first Ja Blog Day will immediately end instances of police and security force abuses. However, for Jamaica’s strong and growing community of Jamaican bloggers to speak up about this issue is important. Ja Blog Day is an opportunity for Jamaican bloggers to strengthen their presence on the Internet and within Jamaican society as important writers and contributors to the public sphere. Jamaica (Ja) Blog Day will be an annual event for Jamaican bloggers. Each year’s topic will be different but the charge will be the same: a day of action in service to Jamaica, speaking on an important issue in Jamaica. Visit http://www.jablogday.tumblr.com and http://www.twitter.com/jablogday for more information and continuing updates. Author apPosted on May 17, 2013 May 20, 2013 Categories Jamaica, Jamaican Police, Jamaican security forces, Police corruption, police harrassmentTags Extra-judicial killings, Jamaica, Police abuse, Police brutality3 Comments on What the police can do…Ja Blog Day!